Minecraft community has developed for a long time. So the number of maps made by community is huge and doesn’t stop increasing day by day. There are various categories of map for you to play such as Adventure, Puzzle, Minigame, PvP, Parkour, Survival, Horror, Tower Defense, and so on. 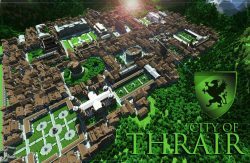 Below is a list of Minecraft 1.10.2 Maps developed by the Minecraft community. Pick one, download it and play solo or play co-op with your friends. You could also add a map to your Minecraft server if you would like to. Please make sure that you pick the suitable map version for your Minecraft. And do not forget to read the instruction on each page to install the map correctly.